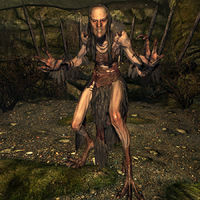 Lucerne is a hagraven that lives in Glenmoril Coven. Lucerne is unused and not actually in the game. According to game data, Lucerne was at one time going to be involved in the quest Ill Met By Moonlight, and has two lines of unused dialogue related to the quest; "We were told you may be coming." and "Return when you have completed the Great Hunt." This page was last modified on 17 January 2017, at 02:26.